× six = fifty four Required Please enter the correct value. 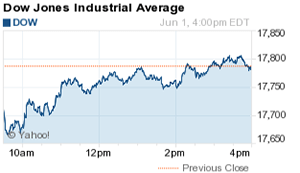 The Dow Jones Industrial Average today (Wednesday, June 1) recovered in the afternoon as improving U.S. factory data helped fuel optimism. However, markets were sliding earlier in the session after negative reports emerged from China on the health of the nation's manufacturing sector. Investors are also weighing the timing of the U.S. Federal Reserve's next interest rate hike. According to CME FedWatch, there's just a 23% chance the central bank will increase rates in June. That's down from 32% on Monday. Here's what else you need to know about the markets on May 31, 2016. First up, automotive stocks had a mixed day after manufacturers reported monthly sales levels. Shares of General Motors Co. (NYSE: GM) fell 3.4% after the firm reported an 18% decline in May sales. The firm said a recent earthquake in Japan affected its supply chain. Despite the recent downturn, it's important to remember just how far the automotive company has come since 2009. On this day in 2009, General Motors filed for Chapter 11 bankruptcy. Sales weren't very good across the entire sector. Shares of Ford Motor Co. (NYSE: F) fell 2.9% after the firm reported a sharp decline of 6% in light vehicles. Even Fiat Chrysler Automobiles NV (NYSE: FCAU) declined 1.8% today, even though the firm said sales increased by 1.1% in May. Another day, another deal. Salesforce.com Inc. (NYSE: CRM) announced plans to purchase website software provider Demandware Inc. (NYSE: DWRE) for $2.8 billion. DWRE – whose clients include Lands' End Inc. (Nasdaq: LE) and L'Oreal SA (OTCMKTS ADR: LRLCY) – saw its stock rally 55.9% on news of the deal. Next, Apple Inc. (Nasdaq: AAPL) was trading near $99 per share after its second consecutive losing day this week. Shares had been on a solid run for the last two weeks after a big boost from Berkshire Hathaway Inc. (NYSE: BRK.A) and speculation that the tech giant could use its massive cash haul to purchase streaming giant Netflix Inc. (Nasdaq: NFLX). The stock is under some pressure on news the firm could be moving toward a longer research and development cycle for its iPhone products. The firm is also now facing a lawsuit from Caltech over alleged copyright infringement. Crude oil prices slipped slightly this afternoon but rebounded from earlier levels on news OPEC is looking for ways to establish a production ceiling in order to support global oil prices. The global oil cartel has been under pressure after Iran announced that it will not take part in any production freeze. OPEC's ongoing battle against U.S. shale producers has fueled a massive slide in global prices. WTI was flat despite heightened U.S. demand expectations. The summer driving season kicked off over Memorial Day weekend. Meanwhile, Brent crude oil prices were slightly off on the day. But the big news today was the turmoil in the retail sector. Shares of Under Armour Inc. (NYSE: UA) and Nike Inc. (NYSE: NKE) both slipped on warnings about the impact of the pending bankruptcy of sports retailer Sports Authority. Under Armour stock fell 3.9% after it slashed its sales outlook for this fiscal year. Meanwhile, Morgan Stanley (NYSE: MS) downgraded shares of Nike on growing competitive pressures and concerns about market share. On the earnings front, shares of Michael Kors Holding Ltd. (NYSE: KORS) rallied 6.6% after the retailer reported strong quarterly earnings. The firm reported earnings per share (EPS) of $0.98, beating consensus expectations by $0.02. The firm also announced a $1 billion buyback program to boost shareholder value. Investors who have been hungry for growth and profits found an 8.4% gain in shares of Cracker Barrel Old Country Store Inc. (Nasdaq: CBRL) on Wednesday. The restaurant operator shattered earnings expectations, pushing the stock to an all-time high. One of the best performers today was Whole Foods Market Inc. (Nasdaq: WFM). The grocery store giant's stock gained 4.9% after receiving an upgrade from European bank Credit Suisse Group AG (NYSE ADR: CS). The investment firm issued a "Buy" rating and said it believes the firm's 365 store strategy is a positive for the stock over the long term. The company is opening smaller stores in urban areas over the coming years.